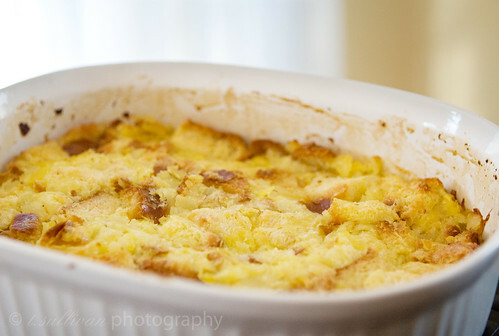 I was hoping to get this recipe posted before Easter, but clearly that didn’t happen. However, maybe you can put it to good use while trying to use up your leftover ham! You’re doing that too, right? I feel like I’ve been eating ham for every meal since Sunday, but I somehow still haven’t made a dent in how much of it I have left. Anyway, this recipe here is the whole reason I eat ham. I’m not a vegetarian or anything, but I prefer my pork in other tastier forms, namely bacon. But I will eat ham if it means I get to eat baked pinapple on the side. This dish had been a staple at our family holidays since I was a kid, and to this day we still beg my mom to make it at every opportunity. I think what I’m trying to say here is that it tastes really, really good, and I’m pretty sure you’re going to want to eat this. Beat butter and sugar until smooth. Add eggs and beat until combined. Add pineapple (juice and all!) and mix well. Bake uncovered at 350° for about 50 minutes to 1 hour, or until cooked through and lightly brown on top. 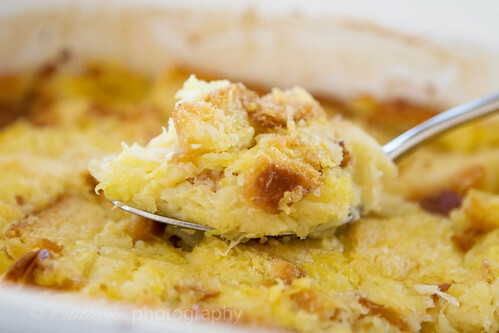 My in-laws make a casserole like this – but theirs has Ritz Crackers instead of bread. I think their version has cheese, too. Does this reheat well? Or freeze? Wanted to make ahead of Easter so don’t have to worry. Suggestions?